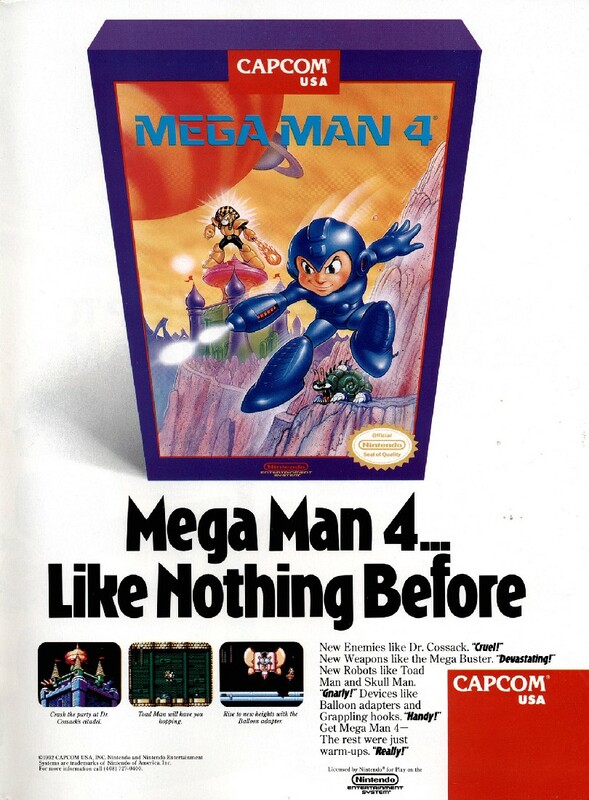 A long look at Mega Man advertising below. Those days are long gone, but their memories came rushing back as I turned the electronic pages of Retromags. And of seeing all these tidbits again, what surprised me with the greatest sense of nostalgia was seeing those despicable advertisements once again! 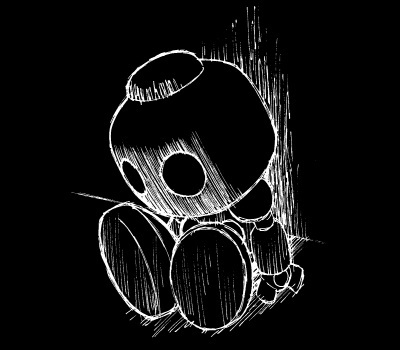 It’s funny how even the things you previously hated can feel like coming home after sufficient time. Capcom’s blog already covered quite a few of the early Mega Man ads awhile back, so I’ll just skip to a few that they missed, like this “Gnarly!” classic ad for Mega Man 4. 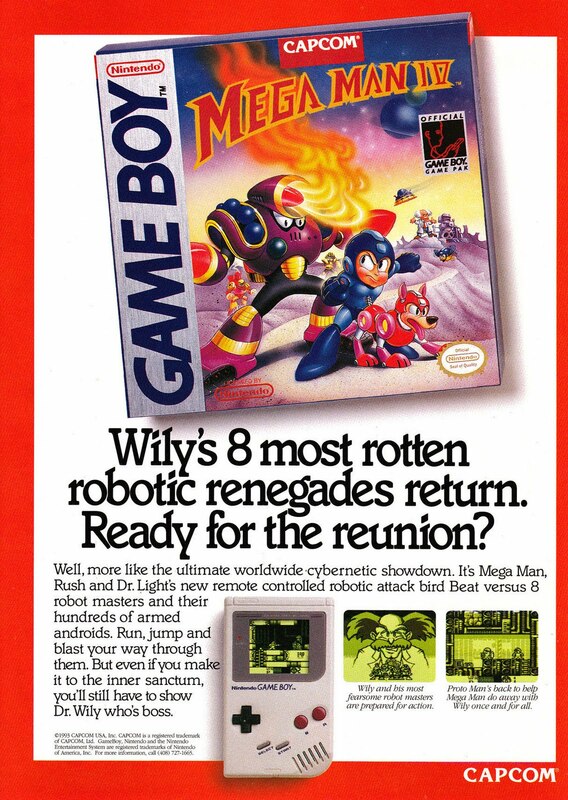 Appearing around the same time (or a little earlier) was this ad for Mega Man Dr. Wily’s Revenge. Its sequel garnered an ad of a slightly different style, this time appearing over the right halves of two pages. I smooshed the two halves together below. What a Rush! 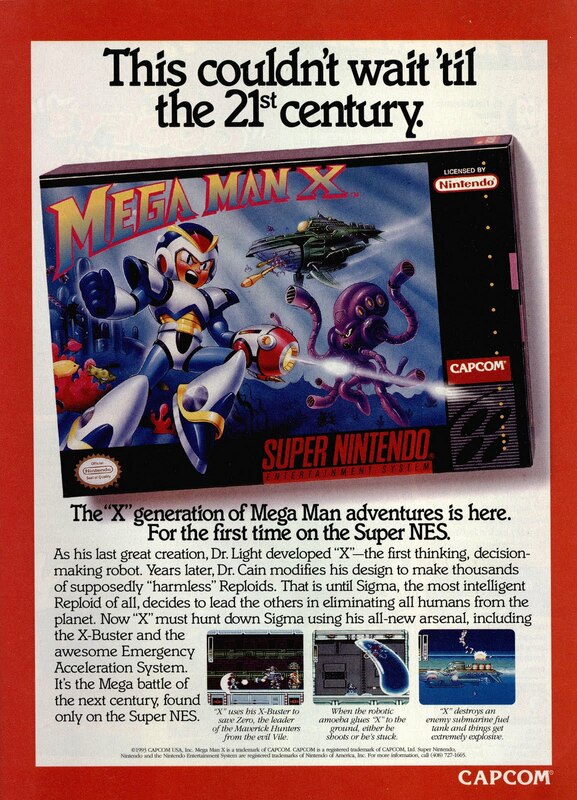 …and even the beginning of the X series! But time changes all things, and so as we entered the mid 90s Capcom started deviating from the pattern more and more. Like this archaeology themed ad for the same game when it was re-released for PC. 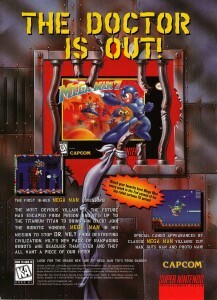 Mega Man 7 broke out of the mold by breaking out of prison. 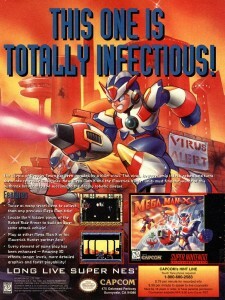 X3’s ad used some beautiful original artwork that I actually like more than the Mega Man X3 boxart itself. 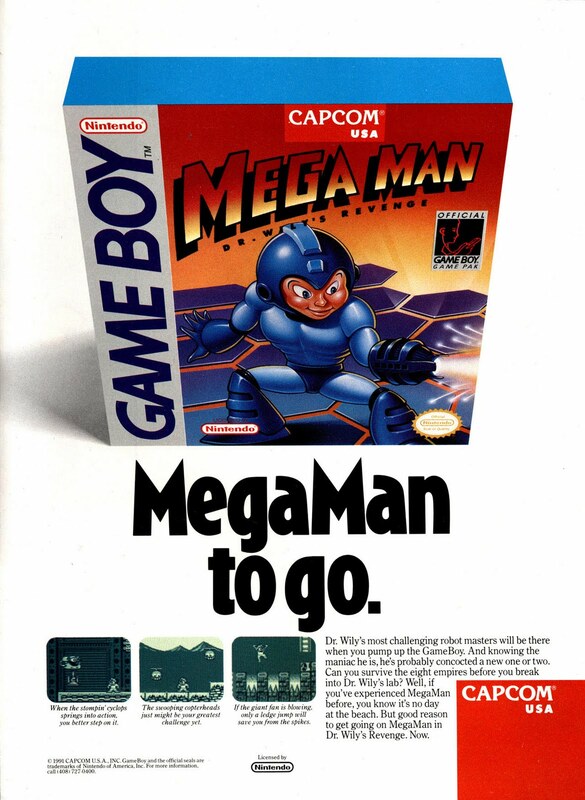 Bringing up the rear of this advertising excursion, Mega Man 8 announces the return of the Blue Bomber! Although before this point, I’d say he was more commonly touted as the “Titanium Titan.” It makes a bit more sense too, since aside from some select special weapons he doesn’t really do that much bombing (except occasionally in sales). According to Japanese source material, he truly is made of a ceramic titanium alloy. Blue Bomber or Titanium Titan…what do you guys prefer? That’s all for now, but you can expect another Retromags-themed post tomorrow. All of the above ads can be found in various magazines uploaded there, so go check it out and lend the project your support! 12 Comments to "Retro Ads"
Nice. Had a lot of these on Capcom wiki already, but I missed a few good ones. Thanks for posting! Cool. Glad they’re being put to good use. Were they really considering it earlier than X4? Maybe it was too late to put in the game, so they settled with a short opening stage section as Zero, then included him fully in X4. I really liked those cheesy jokes, like “what has four legs and flies? Rush, of course”(Rush can fly), and “this one’s infectious!”(the Sigma Virus). I too also like the ad art better than the box art. 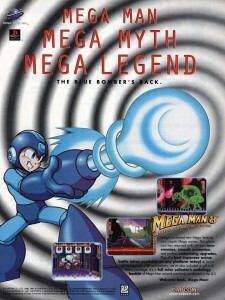 Hey, can you tell me which magazine and issue the mega man x3 ad is from? 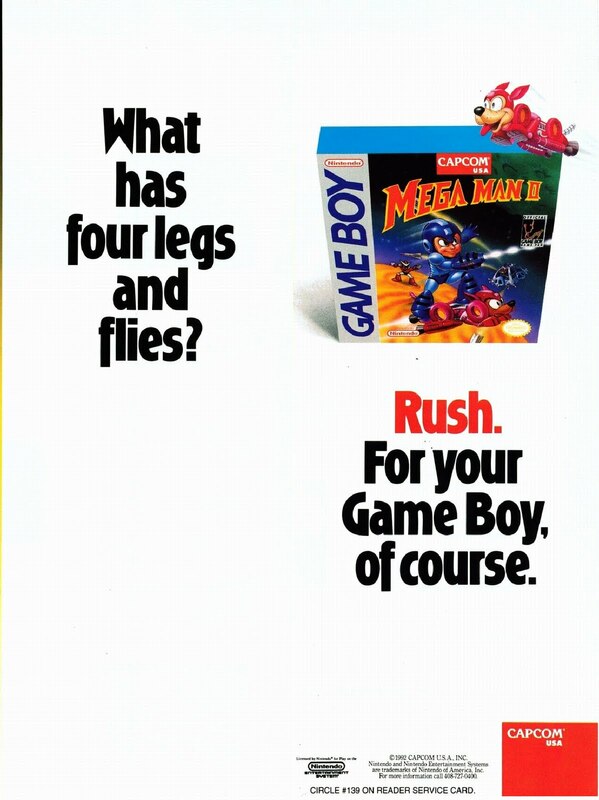 I had most of hte nintendo power mags from that era but couldn’t find that ad. 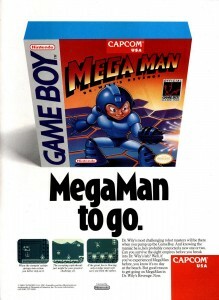 I’m a big mega man fan and I’d love to have it. Thanks! GamePro vol 77 from December 1995, Donkey Kong Country 2 on the cover. 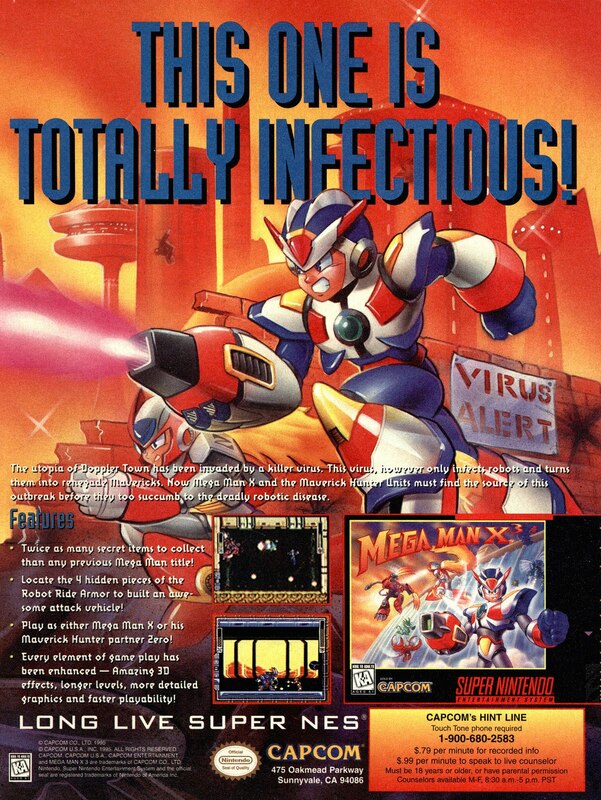 It certainly ran in more magazines than just that, but #77 has a Mega Man X3 review in it with some prerelease game screenshots, so I’d go with that one. 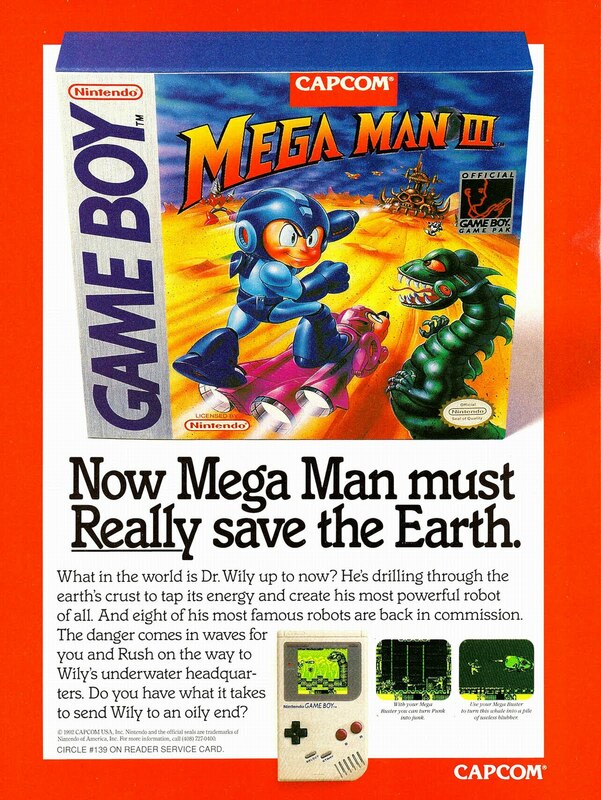 Hello again, I’ve actually started a collection of mega man ads. 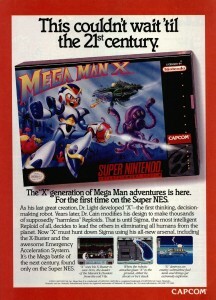 I was wondering if you knew anything of the mega man x2 ad. Specifically where I could find it. 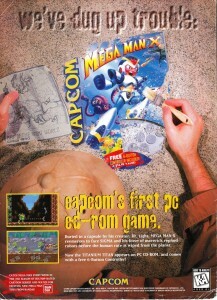 I’m also looking for the mega man 7 ad you posted. Any information you have or can provide would be greatly appreciated. Cool hobby! MM7 ad was from GamePro 75. X2 I’m not sure…. I wish I had sourced these better. Awesome! Thanks for your help. 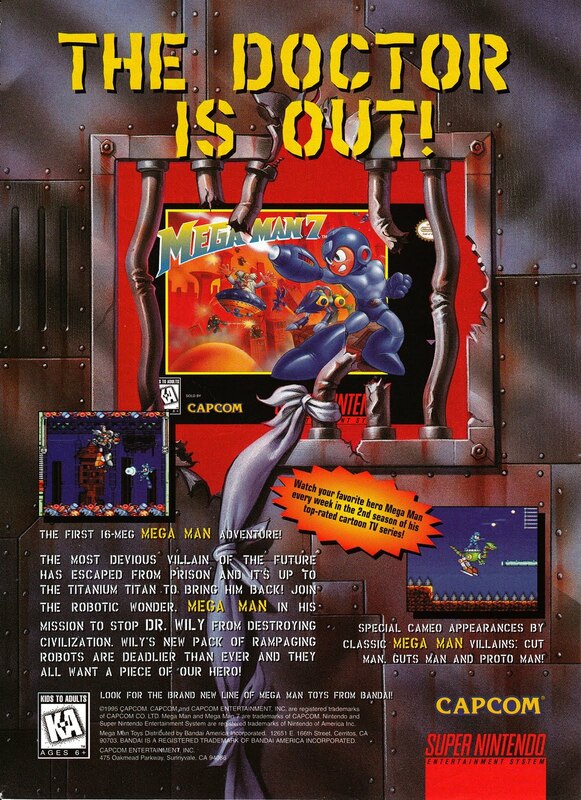 That mega man x2 ad may have only been released overseas, I noticed it was on an Australian Gaming website. Do you know where the NES mega man and Gameboy mega man ads came from? I bought a few online and they’re rather small, which makes me think they were in comic books? 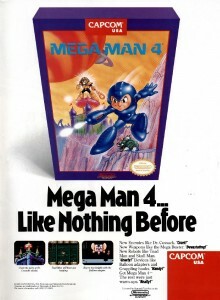 I’m specifically looking for mega man 4 ads for both the NES and gameboy. 4 and IV? GamePro 31 and 53. Most of the ones I put on this page are from GamePro, because Retromags had the most extensive collection of those at the time. 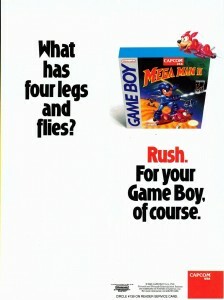 I’m sure they appeared in other gaming mags too, and perhaps even comics, but I must admit I have no idea about that.